It was quite a surprise then when at a recent Probus meeting, guest speaker, Kevin Lindeberg, spoke about his involvement with what we could call Bert Hinkler’s last epitaph. 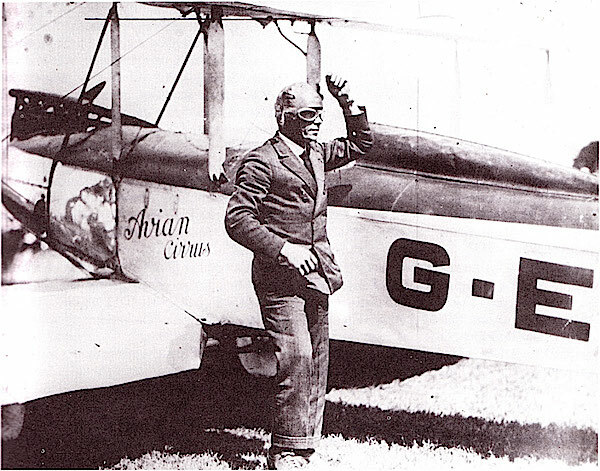 Bert had died after his Puss Moth plane crashed in the Italian Alps on 7 January 1933 when he was then attempting to break the world record for a solo flight to Australia. In 1974 Kevin Lindberg was shown the crash site by a Italian carbon collector, Gino Toichhioni, who had found Hinkler’s plane in April 1933. They left two markers: one at the crash site and one where Bert’s body was found 80 metres away. Last year, it was decided to erect a memorial at the crash site, and because Kevin is now the only Australian alive to be personally shown Hinkler’s final resting place, he was taken to Italy to identify where the plane had crashed and where where Bert Hinkler had dragged himself before he died. The plane site marker was missing but was found by Franco Scarpini who looked up at the sound of a Lone Eagle flapping above him, where he found Bert’s death site marker still lashed to a tree, but – 40 years on – now high above the ground. By a strange coincidence, Bert Hinkler often referred to himself as a Lone Eagle! The memorial is be hewn from a 1.4 tonne basalt boulder from Bundaberg’s Mon Repos Beach where Bert originally learnt to fly. It is to be unveiled on August 2nd this year.